Jac Review Week: Why are inside turns important during groundwork with a horse? “Stacy, I’ve been following Jac’s video series and am loving it. Thank you so much for sharing it!I have a question about the inside turns: why is it so important to you that he turn to the inside instead of the outside? 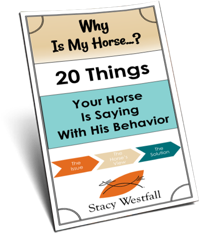 I have learned to turn to the outside and have trained my horses accordingly and am wondering whether I should retrain myself and them. In order to do that, I figure I need to understand the reasoning better. Inside turns and outside turns have a subtly different effect on horses. It isn’t that one turn is ‘correct’ and the other is ‘incorrect’ but instead they both have different side effects. Both outside turns and inside turns will help the horse learn to read your body language and will promote respect. The outside turn is often more important for teaching respect. If you have a horse that is pushy and in your space the act of cutting the horse off and driving him into an outside turn is an act of dominance by the handler. The inside turn is better for teaching the horse to draw to the handler. Inside turns are very useful with horses that have trust issues because they subtly suggest submission. Taking a step back or away from the horse is used to draw him in towards you. Maybe the strongest argument for teaching both the handler and the horse to do both inside turns and outside turns is that both will learn to read each others subtle cues. If you go back and watch Episode 3 with Jac you can easily see that Jac does not respect me. When Jac is leaving, or dragging me, it is clear to see that it is not out of fear. He looks annoyed and testy but not frightened yet he still pulls to the outside or away from me as a form of defiance. In Episode 4 watch Jac’s body language, he is arched away from me. Specifically watch his right eye at 8:20 and again at 8:30. You can see that his eye is looking away from me so much that you can see the white. He is physically near me because the rope is holding him…but if there were no rope he would be gone. Episode 13 talks the most directly about this subject. Jac has been a more dominant kind of a horse. He respects my space enough that I don’t feel the need to turn him to the outside but the way that I am driving him forward with the whip is accomplishing the same thing; establishing myself as the dominant one. Around 12 minutes in Episode 13 Jac starts making the mistake of turning outside. I call it a mistake because I was asking for the inside turn but Jac was distracted by the tarp so he didn’t focus on my body language. You can see how I correct him by quickly turning him back to his original direction and then asking for the turn again. In Episode 14 you can see how the ability to ask for an inside turn makes it possible to focus a horses attention on an object. This is not possible with an outside turn unless the object is directly on the fence. 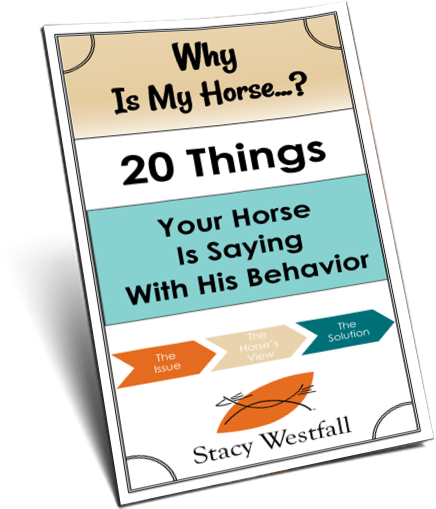 The most important thing to remember is that inside turns and outside turns accomplish different things one of the biggest being the ability of the horse to read the humans body language and the human to read the horses body language…and that is a pretty big thing. ← The student and the horse can both tell if the teacher cares. My 2 year old horse, in the beginning, never did inside turns and would always go to the outside. So Id send her the same direction again. So eventually she did get it. But then I think she thought when Id back up she was boss and could move my feet. So now she does it but her ears are always flat back? Is there a way to train her to do an inside turn without all the ‘aggressive looks’? Thank you so much for taking the time to answer my question. Your answer makes perfect sense to me. You know when something makes so much sense that you want to slap your forehead and go “duh”? You’re an inspiration as always and I will start working on the difference between inside and outside turns tomorrow. Glad you found it so quickly! Have fun with your horse…I’m headed to ride now too. It’s 10pm here so mine will have to wait till tomorrow. I breed quarters and teach western riding in Portugal, which served as excuse to end up owning a dozen horse actually. My three year olds are following in Jac’s footsteps. Really useful series!